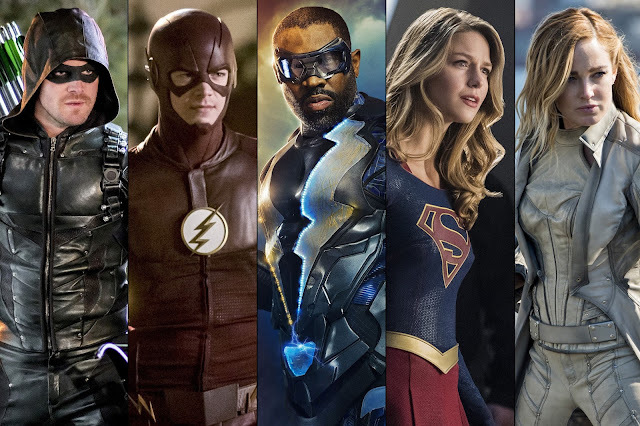 This week we had a future set episode, secrets revealed, a finale, and one of DC's most iconic characters come to the Arrowverse. Quick thoughts this week, but you can read them all below. *Yes, I know Black Lightning is not in the Arrowverse officially. But neither was Supergirl...until it was. I am including it here for convenience sake. Supergirl - Episode 4.15 - "O Brother, Where Art Thou"
I never thought we'd see Superman or Lex Luthor show up on Supergirl, but now we've had both. Now all that is left is to see them on screen together. But for now, let's just enjoy Jon Cryer's incredible take on one of DC's most iconic villains. If I had to ask one thing, it would be for them to stay true to the character and they did. No Jolly Ranchers, no piss in a jar, none of that stuff. Cryer was embodied every thing Lex is. Charming, evil, cunning, smart, emotional, selfish, and a little campy. His whole plan to push Lena, from shooting James, (or Jimmy, as Lex calls him, because of course he does!) to planting one of his people as her assistant, to using her past on her was genius. The whole thing was genius. The episode only suffered when Cryer wasn't on screen. Which is saying something, because the other storylines were pretty strong too. Namely, J'onn and Manchester. The resolution of that seemed a bit anti-climactic. I am not wholly convinced that Manchester is gone, but if he is, I understand the residual damage left to J'onn because of it. They actually did some relationship work between Brainy and Nia too, and obviously there is some sort of revelation yet to come, because Brainy knows something about Nia that she doesn't that is preventing that relationship from happening. James sister came to town, and put things into perspective for Alex who was angry at Kara for not being there. There was a lot of character work done for a lot of people, but Cryer's take on Luthor overshadowed all of it. The best part is that this was just the set up. The end of the episode showed Lex at his most diabolical, fully back in power and completely healthy. The best of Cryer's Lex is yet to come, and that is fantastic. Overall, a wonderful episode. Last week's was so powerful, and this follow up was just as enjoyable. So Supergirl is on a great streak right now. Hopefully it continues. Arrow - Episode 7.16 - "Star City 2040"
This was the first all future episode of Arrow, and one thing is for sure: They did a fantastic job of keeping the fate of Oliver Queen vague. He was talked about in the present tense sometimes, and the past tense sometimes. With the show ending, and with the lingering thread of his Elseworlds deal hanging in the balance, they are keeping things close to the chest. It was awesome to see the story of Mia Smoak - and see how it involved Nyssa Al Ghul. Nyssa and Roy both went off on a mission with Thea, but as we've seen both of them return to do other things in the show, then maybe something happened with Thea. She was the one character that the showrunners promised never to kill, so its more likely that she was just at a point that Nyssa and Roy's help were no longer needed. It was nice to see the second generation of Original Team Arrow work together. The son of Oliver, the daughter of Felicity, and the son of Diggle. Connor Hawke is part of an organization similar to ARGUS, yet they dismissed ARGUS as something bad. But he is following in his fathers footsteps nonetheless. Everything that we have seen happen in 2040 seems to be because of the Archer program Felicity had a breakthrough on in 2019. There are only 17 episodes of Arrow left, ever. If they want to gear up for any sort of happy ending, they certainly haven't started yet. Things only seem to get more and more dire. The show set Rene up as the bad guy in the future, but this episode fixed that, which is good. I hope this wasn't the conclusion of the 2040 stuff, with the end in sight, these should keep going until the show ends. Unless of course, a spinoff is being set up. If all this future stuff is to set up its own show (maybe called Star City?) then they could possibly be holding back. Before the announcement of the show ending, I thought Emiko Queen was the future of the show. It looks like she's the villain instead. But I still feel that the seeds of a spinoff are being planted. I was just looking in the wrong direction. I liked this break from the present day stuff, but glad it was only the one episode. The flashes work best, so to have a little bit of each time period in the episode is best case scenario. It looks like we will return to that next week. Black Lightning - Episode 2.16 - "The Book Of The Apocalypse: Chapter Two: The Omega"
Finales are always great. Black Lightning did their first finale well, and the second one was just as good. In fact, the this one felt a bit more satisfying, as there was finally some closure with Tobias. I do not think for one second he is off the show, or out of the picture. But at least he has been knocked down a few notches, even if its temporarily. Jefferson Pierce's whole mission stems from Tobias. He can never really be completely gone from the show. Like Lex Luthor to Superman, or the Joker to Superman, other villains may come and go, but there will always be a constant. The most powerful moment was Jeff saving Jen from the darkness of killing Tobias. Jeff's family is the most important thing to him, and they are in more danger than ever before. Having Agent Odell enlist them in a mission to help against the Markovians wasn't all that surprising, and was a perfectly natural set up for season 3. But the biggest surprise of the episode wasn't surprising at all if you know how to read. Odell has Khalil in a pod. Jordan Calloway, who plays Khalil was still a series regular well after his death. So his return was always expected to those that saw that. He will probably be a regular next season too. There were some loose threads still dangling after the episode, but they were minor things (like Grace) that will bleed over into next season. Its good to keep that connective tissue there. This season overall was very enjoyable. There was a bit of stumble with the whole Romeo and Juliet gang side story thing, but that could very well come back with a vengeance next season to make it worth it. I do hope the cast gets to participate in Crisis On Infinite Earths next season, it would be fun to see them mix it up with the other CW heroes. The Flash - Episode 5.17 - "Time Bomb"
Nora finally got what was coming to her. She unfortunately hasn't been written as a very sympathetic character. If the intent was for her to be so, they failed. If she wasn't supposed to be, then job well done. Injecting the influence of Eobard Thawne this season was a stroke of genius. It has given this season a different feel to it, with higher stakes than usual. For the team to finally know about that now, is great. The entire cast was in that scene, even Danielle Panabaker, who was missing from most of the episode. I hope the rumors of her not getting along with Candace and leaving the show after this season are false. But her absence did nothing to help quell that. The new Cicada - Grace from the future - seems about 20 years older, which means she could be from around the same time as Nora and Thawne. I wouldn't be at all surprised if this is a manipulation from Thawne, and he sent Grace back as well. Like Lex in Supergirl, I don't buy his helplessness for a second. Thawne is most likely pulling the strings of every single thing happening this season, including the second Cicada. If this is just at an end point to get Thawne to be the big bad again next season, then all of this will be worth it. Sherloque figuring out Nora's mystery was perfect TV timing, however, the reveal didn't sit right with me. Nora was told by Thawne to tell Barry, yet she didn't want Sherloque to do it. If on the off chance Thawne is genuinely helping, then she hurt things by not doing it. If he is manipulating her, why all of a sudden resist now? Even with the whole meta secrets subplot that was way too on the nose? It was a great idea that didn't seem executed properly. Hopefully the stumbles can let them rest of the episodes be strong. With the conspicuous absences, and uneven character development, this season has been all over the place. Now is the perfect time for it streamline and head for home base. The best episode this week was Supergirl. Cryer's portrayal of Luthor was fantastic and put it over the top of anything else presented this week. He is only around for 3 episodes, but hopefully they can find a way for him to return in Crisis as well.